Instead of attending a real wedding, my daughter and I have been watching reruns of My Fair Wedding with David Tutera. We tried a couple episodes of the new version, My Fair Wedding: Unveiled, but it’s a fail in our book. Just saying, the original show had a hook and now I can’t distinguish it from Bridezillas. The world DOES NOT need another show about self-absorbed people creating drama. (1) The bride would have a touching story that made we want to see her wedding dreams come true. (2) I would cry when the vows were being exchanged. (3) The wedding and reception would be breathtaking. I’m convinced my daughter will need a wedding planner when she gets married. I want all of her wedding dreams to come true too, starting with a groom worthy of her, of course. We still have many years to go before we have to worry about any of that, so we’ll stick to reruns of My Fair Wedding, and I think I'm going to indulge in some of my favorite wedding movies this month. Father of the Bride (Steve Martin) – I never saw the original version with Spencer Tracy. It could be just as good if not better than the remake, but I love this movie. I cry every time I see the main character’s daughter sleeping on the couch with a magazine about planning a wedding on a budget. 27 Dresses (Katherine Heigle & James Marsdel) – This was fun, and I really liked how the relationship between the two main characters developed. I was routing for the heroine to become a bride at last, but with the right guy. I wasn’t disappointed. Four Weddings and a Funeral (Hugh Grant & Andie MacDowell) - I loved this movie even though I wasn’t crazy about the heroine or hero. The supporting characters elevated it from so-so to great. And the montage at the end showing everyone getting their HEA? LOVED IT!!! The Wedding Singer (Adam Sandler & Drew Berrymore) – First of all, I love these two actors together on screen. Add 80s music and big hair, and what can go wrong? Definitely a favorite for me! Monsoon Wedding (Vasundhara Das & Parvin Dabas) – It has been a while since I saw this movie, but I remember it being a pleasant surprise. Set in India, this movie is about an arranged marriage between a contemporary hero and heroine. It’s a romance with a happy ending. Nothing like having that happy glow at the end of a movie, unless it comes from a romance novel instead. 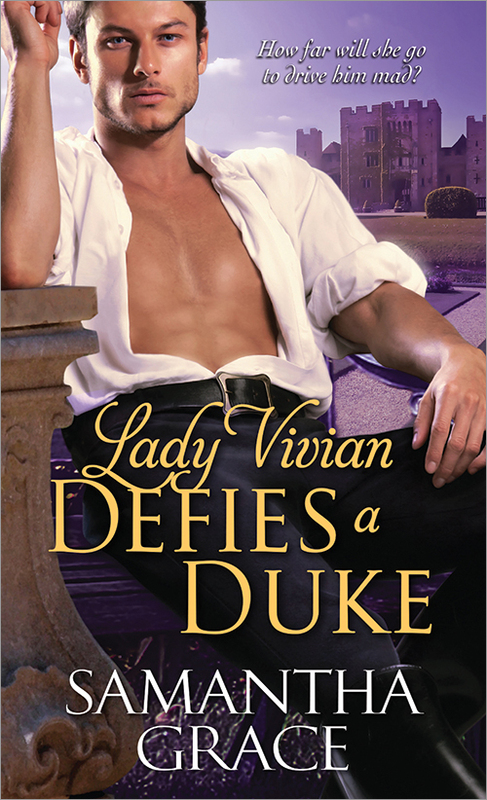 Might I suggest Lady Vivian Defies a Duke? Do you have a favorite wedding movie or TV show? Do you cry at weddings like I do? I don't even have to know the people well and I get misty-eyed! To learn more about Samantha's Regency romance novels, visit her website. Wonders never cease. I've actually seen the first three movies you listed; four actually if you count the original "Father of the Bride." I love Mama Mia. Tweeted. Y'all should definitely watch The Philadelphia Story, with Katharine Hepburn, Cary Grant and Jimmy Stewart. I've seen all of those movies. Love them! I highly recommend wedding planners. I had one, and my sister (who is planning a wedding now) has one. They don't have to cost a fortune. I just needed someone to walk me through the big things and a few small things too. Loved all the movies you posted about. I actually loved MY Best Friends's Wedding and The Runaway Bride too.